Film score by John Williams, et al. 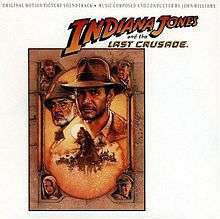 Indiana Jones and the Last Crusade is the soundtrack to Steven Spielberg's 1989 film of the same name. It was released by Wea in 1989. The music was composed and conducted by John Williams, and performed by a studio orchestra. The official album only contains key moments from the film's score and is out of print. The expanded edition was officially released by Concord Music Group in a box set with the soundtracks of the other Indiana Jones films on November 11, 2008. Williams' arrangement of the Königgrätzer Marsch, the German military march that is played during the Berlin book burning scene, does not appear on the soundtrack. Tracks do not appear in the order that they occur in the film, but instead in a succession chosen by Williams for listening purposes. Listeners interested in hearing the selections in score order may program the album thus: 1, 2, 4, 5, 3, 6, 9, 10, 11, 12, 7, 13. 1. "Indy's Very First Adventure"
3. "X Marks the Spot"
7. "Father and Son Reunited"
9. "Scherzo for Motorcycle and Orchestra"
12. "Keeping Up with the Joneses"
13. "Brother of the Cruciform Sword"
15. "Belly of the Steel Beast"
16. "The Canyon of the Crescent Moon"
17. "The Penitent Man Will Pass"
18. "The Keeper of the Grail"
19. "Finale & End Credits"
7. "Marcus is Captured / To Berlin"
9. "The Blimp Turns Around"
11. "Wrong Choice, Right Choice"
↑ Michael Beek (September 2008). "Complete Indiana Jones on the way". Music from the Movies. Retrieved 2008-09-16.